I had the pleasure of associating with the H L de Silva, instructing him in our Firm’s Court cases since the time he reverted to the unofficial Bar in 1970, in the year which I was admitted to practice as a Supreme Court Proctor. In fact, when he reverted back to the unofficial Bar in 1970, his first brief was from our Firm as V Murugesu my Senior, had encouraged his good friend H L de Silva to join the private bar and I remember the pleasure of instructing him to obtain an interim injunction in a case involving the National Lotteries Board. That was his first appearance at the unofficial Bar after leaving the AG’s department that too in the District Court of Colombo. The last time I met him one year ago was in March 2009 - he recollected a number of cases including the Collettes -v- Bank of Ceylon case, in which he worked hard and he shared his pleasant as well as his bitter experience of Hulftsdorp in his forthright manner. 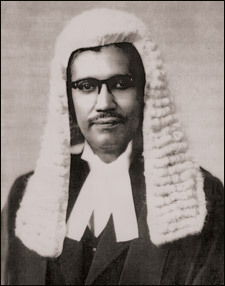 When the fundamental jurisdiction was given to the Supreme Court, it was H L de Silva who created history by arguing and extending the scope of jurisdiction. I sat by his side (instructing him) and watched how he fought for a student who was denied admission to Medical College. That was the case of Perera and another -v- University Grants Commission reported in (1978, 1979, 1980) Sri Lanka Reports page 128. That was perhaps the first fundamental rights application successfully argued on the right to equality of opportunity under Article 12 (1) of the 1978 Constitution. The petitioner was his niece but there is no doubt he would have argued the case with the same vigour even if it was for a stranger. Two leading cases in which I had the pleasure of closely working with this Hulftsdorp Lion were Collettes -v- Bank of Ceylon and ‘Rabea’ Trade Mark case. Having asked his senior P Navaratnarajah Q C who was always a ‘Master of facts’ to present the facts in Collettes case he argued the questions of Law. Like all the others who appeared for Collettes Limited he regretted that we lost the appeals for mysterious reasons. He was talking of his disappointment with the judgments of Superior Courts even when I met him in March 2009 - a few days before his unfortunate demise. The other case which was also fought hard was infringement of trade mark “Rabea”. When arguing the appeals in the Superior Courts he got Lakshman Kadirgamar, P C who was his junior in those appeals also to argue some of the points of appeal. Thus he was an excellent team player. At conferences he would discuss the issues with us. I always remember him as one of the Seniors from whom I had learnt a lot during the period of four decades. He was persevering and hardworking. He was fortunate to have his wife who stood by him not only in his personal life but also in his career. He used to tell us how his wife was helping him in typing and re-typing drafts which he would keep on changing during the times when there was no computer. He used to get up at 4.00 a m and study the briefs and prepare for the Court work of the day. “.... unlike other organizations of persons who are engaged in an occupation, the Bar Association is not essentially a trade union or a body of persons who are engaged in wielding power or authority through collective action. It is principally and above everything else an association of professional men. “What binds them together is their commitment to upholding certain principles, standards and values in the conduct of their professional business. It engenders in them or at any rate ought to create in them a certain pride in the observance of rules of conduct and etiquette, even when compliance with the rules may not always be to their personal advantage, if considered from a narrow and selfish viewpoint. In a country where people seek offices for their personal glory, H L de Silva, brought honour to the office of the Bar Association of Sri Lanka (BASL) President when he was elected to that office. H W Jayewardena, Q.C., promoted the candidature of H L de Silva, for the presidency of the BASL despite the latter’s political alignment was to the opposite camp. The present day colleagues at the Bar should be reminded how both those great leaders of the Bar - ‘H W’ and ‘H L’ - rose above the political party differences to protect the interests of the BASL.